While it is arguable who invented the first pot of burgoo, French chef, Gustave Jaubert, known as the “Father of Burgoo,” was hired by Buffalo Trace distillery to cook for their employees. You can actually view his iron kettles and burgoo recipe still on display at the Frankfort distillery. 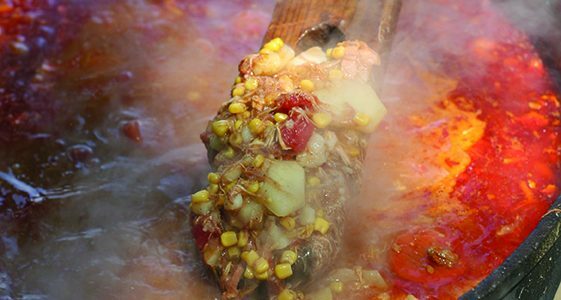 Where did the name burgoo come from? 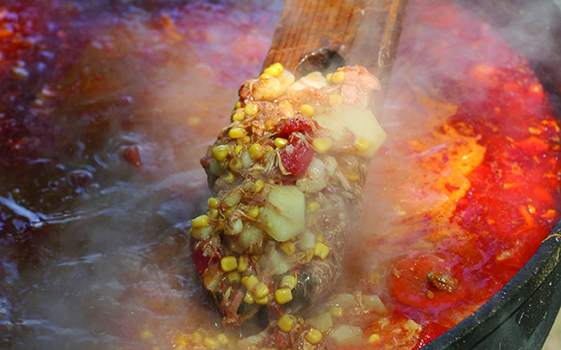 It is thought that burgoo might have gotten its name by combining the words barbecue and ragoût (the French word for stew). But no one really knows for sure how it got its name! Burgoo has the likings of a hardy vegetable stew (if you added meat) and consistency of a bowl of chili. No two pots of burgoo are the same, so you may encounter a range of mild to spicy flavors. The real challenge is how it’s made, which is historically is in large batches in large iron kettles over an open fire. Early burgoos were joked to be “road kill-stews,” because they contained a hodge-podge of whatever wildlife ingredients were available, but that certainly is not the case in this day in age! The main ingredients include a variety of vegetables and is usually made with more than one meat, such as chicken, beef, pork, mutton, or if you’re a burgoo chef that hunts, maybe venison, rabbit, or even squirrel! Some chefs even claim a splash of Kentucky bourbon as their secret ingredient. How do you pronounce burgoo? You might have heard it pronounced bur-GOO, but this traditional meal has strong roots in Kentucky, and most Kentuckians would tell you to pronounce it BUR-goo! Feeling hungry? Head on over to our Dining Page to see what’s cooking locally.